The present study was designed to establish quality control parameters for pharmacognostic evaluation and differentiation of eight locally derived Boehmeria species, B. gracilis, B. nivea, B. pannosa, B. platanifolia, B. quelpaertensis, B. spicata, B. splitgerbera, B. tricuspis, and two varieties named B. japonica var. longispica, B. nivea var. concolor, which have been utilized as the folk medicine, ‘Mo-Si-Pool’ in Korea. Although the outer morphological study of these species had been reported, there is no pharmacognostical description yet. Therefore, inner morphological evaluation on leaf midrib, petiole and stem of eight Boehmeria species and two varieties was accomplished along with preliminary phytochemical analysis by HPLC–DAD profiling. The microscopic data showed discriminative inner morphological characteristics such as collenchyma cell layer, thickness of cortex and xylem, frequency of druse and hairs, and number of vascular bundles. The HPLC profiles exhibited more than four characteristic peaks. The molecular ions of the four peaks (1–4) were tentatively identified by ESI–MS, and their structures were identified by NMR spectroscopy to be the flavonoids, rutin (1), isoquercetin (2) and kaempferol-3-O-rutinoside (3), and a phenanthroquinolizidine alkaloid, (−)-cryptopleurine (4). While compounds 1 and 2 were detected in all samples, compound 4 was determined only in B. japonica var. longispica, B. pannosa and B. quelpaertensis and B. splitgerbera. 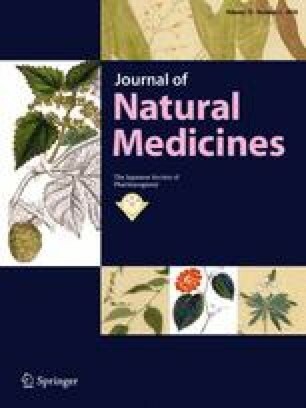 These findings provide the initial scientific criteria for proper identification and establishment of standards for use of Boehmeria species in traditional medicine. Kazi-Marjahan Akter, Hye-Jin Kim, and Atif Ali Khan Khalil contributed equally to this work. The online version of this article ( https://doi.org/10.1007/s11418-017-1164-8) contains supplementary material, which is available to authorized users. We would like to thank Prof. Mario G. Ferruzzi at Plants for Human Health Institute, North Carolina State University, NC, USA for editing this manuscript and giving precious advice, and Dr. Jin Hee Park at Nakdonggang National Institute of Biological Resources for collecting Boehmeria species in Ulleung Island, Gyeongbuk Province, Korea. The study was funded by the National Research Foundation of Korea, the Ministry of Science, ICT & Future Planning (NRF-2014R1A1A305070 and 2017R1A2B4008859) and the Next-Generation BioGreen 21 Program, Rural Development Administration, Republic of Korea (SSAC, Grant# no. PJ01106402).